The U.S. Postal Service may boast of its ability to overcome snow, rain, and heat, but for some outdoor AV installations, those conditions are the least of the environmental challenges. On All SunBriteTV displays, vents and outlets are hermetically sealed with a microfiber material that prevents outside objects such as moisture, rain, dust, grease, salt corrosion, insects, and small animals from getting in the display.Depending upon the application, AV equipment may additionally need to withstand sand, solar radiation, salt water, and even germs. Oh, and spiders. “Spiders have been known to short-circuit outdoor televisions; spider silk is extremely conductive and can causing arcing,” said Tom Dixon, vice president of marketing for SunBriteTV. Spiders and other creepy-crawlies are not an issue for SunBriteTV products, however. “All vents and outlets are hermetically sealed with a microfiber material that prevents any kind of outside objects from getting inside the TV. This includes all elements of nature: moisture, rain, dust, grease, salt corrosion, and even insects and small animals,” he said. The products also employ gaskets, sensors, and fans that are automatically triggered by extreme temperatures. Every one of the company’s screen products happily functions within the range of -24° F to 122° F (the Marquee Series withstands temperatures as low as -40° F), making them suitable for outdoor applications from Alaska to Arizona. There is no one standard in the industry for protecting vulnerable electronic components against the environment, but many manufacturers voluntarily conform to IEC 529 or MIL-STD-810, in addition to the necessary UL codes. IEC 529 is the International Electrotechnical Commission’s classification system indicating the IP, or Ingress Protection, rating of an electrical equipment enclosure against solid objects, such as dust, fingers and tools, and moisture, ranging from drips to full submersion. MIL-STD-810 is the U.S. Military Standard Rating that in total encompasses 29 tests, not all applicable to audio equipment applications, including extreme temperature swings, salt water spray, humidity, particulate matter, and ultraviolet solar radiation. 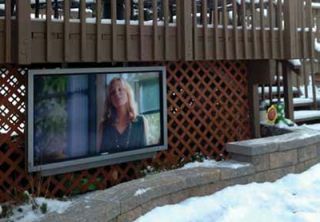 At its most basic, any product destined for outdoor installation is typically weatherized. Community Professional Loudspeakers, for example, takes extreme protective measures on its WET—Weather Environmental Technology—products, which are designed to withstand sustained exposure to harsh climatic conditions. Conveniently, the weather-defying materials in the company’s WET Series II, such as fiberglass, stainless steel, polyimide, and carbon fiber, also offer favorable acoustical properties. Each enclosure is fitted with Community’s Weather-Stop multi-layer protective grille, which prevents water intrusion and is covered with a mesh screen of rustproof UV-resistant synthetic material. Of course, some conditions are not only hazardous to AV equipment but also lethal to humans. Without surge protection in the circuit, electrical shorts, under- or over-voltage incidents, and lightning strikes can potentially be very costly. Sometimes customers may only realize the true value of surge protection after the fact. Martin Dornfeld, northern regional manager for SurgeX, has received calls from large college campuses featuring smart classrooms outfitted with the latest technology following lightning strikes. “I’ve been told, ‘We put your product into a number of our new buildings. Some of our older buildings were protected by other products that claim to provide surge protection, or had limited surge protection. The classrooms that were protected by SurgeX had no ill effects, but the other classrooms that were protected by other surge protection products or had limited surge protection, boy, we lost a ton of gear.’ Those are the best advertisements for us,” said Dornfeld. Some customers specify a seismic rack even if the location is not in an earthquake zone, “just for the added benefit,” said Tracy. Hospitals in California demand racks with an OSH PD rating, he added, and military installations typically require seismic racks regardless of their geographic location. RackLink, the company’s newer IP-powered suite of products includes models with Series Protection, and can also automatically recover from an event. “It can reboot devices from inside the network, meaning it doesn’t need the cloud to reboot the network, for example,” said Tracy. For certain markets, Middle Atlantic’s antimicrobial powder coat inhibits the growth and transmission of harmful microbes. “It can be added to most colors. Typically specified in white, the main places where it’s used is hospitals and schools. The sun’s glare is one of the biggest issues for outdoor screens, as Dixon noted, so SunBriteTV uses specialized screens with a matte finish, as opposed to the glossy finish of its indoor screens. High-NIT panels also ensure that the image is bright and clear, any time of day or night. What is the Most Challenging Rack Build Requirement You’ve Ever Received ? One audiovisual integrator approached us with a very specific need to rackmount equipment within pre-existing nurse’s stations. The solution had to be more compact than any rack option yet conceived, provide all of the attributes of a professional rack, and had to be integrated very quickly at the jobsite. Our custom department worked with the customer and our engineers to design the lowest profile rack frame we’ve ever done, one capable of sliding into pre-built cabinets and credenzas. This gave our integrator the ability to load up and test the racks in their shop, getting them in and out of the hospital quickly. We found other integrators who shared similar needs and ultimately introduced our CFR Series cabinet frame rack to help all our customers with similar applications. One of Lowell Manufacturing Company’s most challenging and rewarding custom projects was brought to Lowell by the late George Kindler (a well-known and well-regarded design consultant to the AV industry) for the Dolby Theater (originally the Kodak theater) in Hollywood, CA. The facility was designed by David Rockwell with the Oscars in mind. The challenge was to design and build sixteen 24U drop-down wall racks with 200- pound load requirement rather than a typical swing-out rack design. This was challenging due to limited facility access and underground cabling paths for production trucks on adjoining public streets. An additional requirement was a triple safety design involving one-inch initial release and secondary handle release for three-second delay oil-filled dampers at eight feet, as well as backup safety cables, while providing adequate service access for technicians. The racks were located four feet off the floor, allowing touring trunks to roll beneath them. This was part of the plan for the large stage presence for the facility to successfully support televised events such as the Oscars and American Idol. Atlas Sound had an integrator that was working with a national retailer chain whose store footprint was not conducive to supporting a full size rack. They needed the rack to be able to support specific equipment, but because of the downtown metro store locations, they wanted the rack to be shippable via FedEx or UPS, and they wanted the rack to be mounted in the corner where a traditional swing out design was not possible. Our engineers embraced the challenge head on and were able to develop the new half width rack units in the WMA series. These new models have a patent-pending fold forward design that allows them to be wall mounted virtually anywhere, allowing the installer access to the rear of the installed components without bending over, and its compact size allows it to be shipped via FedEx or UPS in the original packaging. Additionally, the unit ships in two pieces, so the back box can be sent directly to the end location, and the center can be shipped to the integrator for storage and preloading. Keeping AV equipment at safe operation temperatures is sometimes a challenge, but in some parts of the world where it is constantly well over 104 degrees, it becomes more of a battle. Instead of passive cooling or evening active air flow cooling, we were asked to be sure that our wall mount racks could support rack mounted 6U refrigerating units. They were desired in this area to keep the rack equipment at a cool enough temperature. By controlling vents with NAV8B covers and-top mounted thermostatically controlled fans to exhaust refrigerator-generated heat, we designed a concept that would aid the chiller’s performance. Installers Choice recently completed a TV and sound studio that requested a “high tech” signature look for a three-bay AV rack system, mounted in-wall for the green room of their production facility. Maximum height was 96 inches, overall width 30 inches, depth 45 inches. Our customer liked the look and feel of stainless steel for a rack, but did not want to use stainless because of the cost. Their rack design requirements called for specific cabling and power raceways, which were integrated for quick access and easy maintenance. The custom components were thoroughly evaluated and implemented as the customer had requirements that fell outside the scope of a standard console. This was a crucial step as the budget was based on limited funding. The 77 percent open front/rear doors were chosen to allow the AC to reach the media servers and other AV equipment thru the venting. In every interaction with our customers, we always ask, “What can we do to make our products better and help you with your installations?” The most popular responses are either, “Get rid of the redundancy in the selection process” or “Get rid of the guess work.” With our new line of floor and wall cabinets we are confident that we have addressed both of these issues. The best example might be our EREN-27 which includes a fully welded 27U floor cabinet, five 2U rack shelves, five 2U blanks, a two fan kit, removable side panels, bi-fold steel rear doors, a tempered glass front door, leveling feet, and casters. It’s ready to go right out of the box and the response to this redundancy eliminating, guess work-free solution has been received with great enthusiasm.